Thanks to all of you nice people who responded to – and obviously identified with – my post last night about old-fashioned Halloweens in small, neighbourly places like Queensborough. It is such a good feeling to know that many of us experienced those same happy times in out-of-the-way rural places, and I like the fact that we can share the memories amongst ourselves. It’s like we’re all in the same rural-childhood club. Which, given the fact that the kids from rural areas were never, in my experience, allowed to be the cool kids, is rather nice. A club of our own! I just wanted to follow up by saying that my first Halloween at the Manse in Queensborough in almost 40 years went swimmingly. There were a lot of charming little trick-or-treaters at the door, so much so that I had to package up a few more bags of treats than expected. 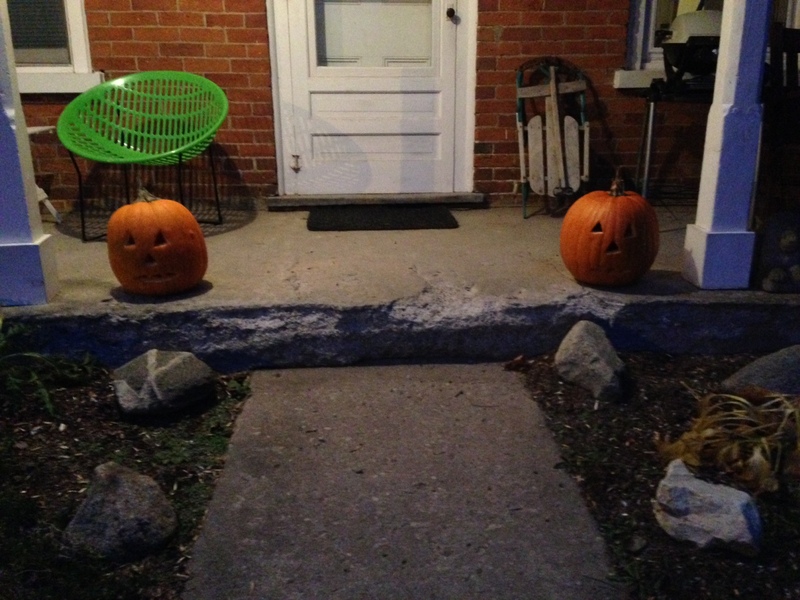 I think we may well have hit a total of 40 or more, and I credit Raymond’s excellently carved jack-o-lanterns (which you can see lit up in the accompanying photo of our ever-so-spooky – okay, not so much – Manse) for that. Who wouldn’t want to visit a Manse with those welcoming jack-o-lanterns out front? We had a few Spidermen, and a witch, and a fairy, and a Batman, and skeletons, and someone from Despicable Me, and even a little panda, who was utterly adorable. And they all very politely said “Thank you!” for the candy. It was a happy Halloween all round. I hope yours was too! 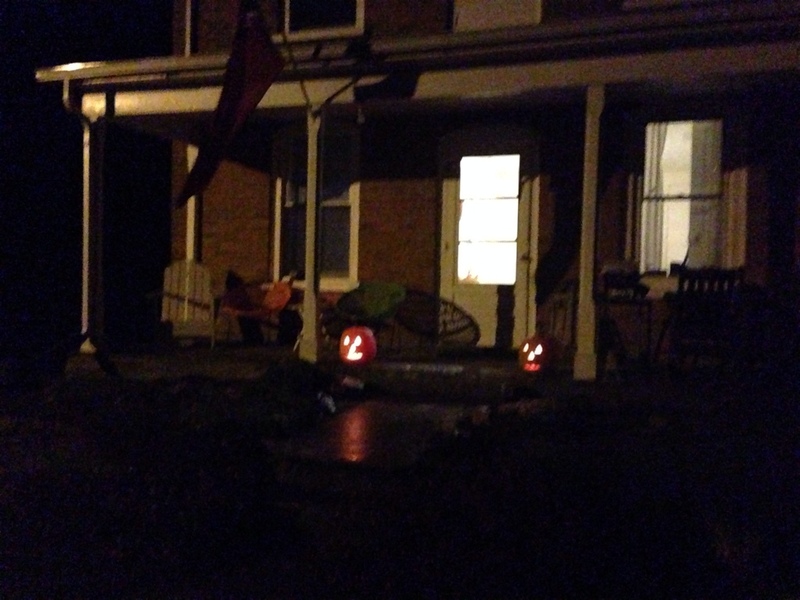 The jack-o-lanterns are waiting on the front porch of the Manse, and tomorrow they’ll be lit. I hope we get a good run of trick-or-treaters! It seemed like there were just the right number of households in the village to result in kids getting just the right amount of Halloween, and of Halloween candy – not too much, not too little. And oh my goodness, the candy back then! A lot of it was homemade (which of course you weren’t worried about because the people who had made it were your friends and neighbours), and a lot of it was fudge – and let me tell you, the women of Queensborough knew how to make fudge. Mostly it was maple fudge, but there was usually some chocolate (my favourite) as well. And homemade popcorn balls, with the popcorn held together with delicious sticky-sweet brown goo. Oh man, it was good stuff. In those days – the 1960s and early 1970s – there were lots of children in Queensborough. (Our total was helped considerably by one household that had about 10 kids). That isn’t the case anymore, so I have no idea how many little trick-or-treaters may end up at the Manse door tomorrow night. I hope there’ll be a good number, because we are ready for them! “Have you ever carved a pumpkin before?” I asked Raymond. “Maybe a hundred years ago,” he answered. But he proved more than up to the task. Raymond couldn’t resist sampling some of the candy. We have lots of bags stuffed with treats for the kids who come by tomorrow evening. My contribution to the jack-o-lanterns was scooping out the innards of the pumpkins. Then to my relief Raymond volunteered for carving duty, and proved to be excellent at it. That done, we hauled out all the boxes and bags of miniature treats we’d bought (far too many, I’m sure, but I couldn’t resist) and loaded them up into individual bags, just like the Sedgwicks used to do for the Halloweens of my childhood. (My mum was not a maker of homemade fudge.) It was a fun evening (especially trying to keep the cat out of the operation), and we felt thoroughly satisfied with ourselves when it was done. I regaled Raymond with tales of Halloweens long past in Queensborough, like how the “tricks” sometimes included pushing over outhouses (which just goes to show you how long ago it was – there were still a few outhouses in those days) and soaping windows. Nothing too menacing; really just some of the local teenagers letting off steam. So yeah, we’re ready for tomorrow. Not as ready as our neighbours Tom and Joanie, who have their annual huge, fantastic (and thoroughly spooky) Halloween display set up; our two jack-o-lanterns look pretty modest by comparison. But I hope the youngsters who stop in to ooh and aaah at Tom and Joanie’s place will also come round the corner for some treats from the Manse. It will take me back to the long-ago happy Halloweens of my childhood. I’ve been trying to find different routes to take home to Queensborough from work in Belleville – an excuse to drive along new (to me) and generally very scenic country roads. One day recently I turned north off County Road 14 (between Belleville and Stirling) up a road called Baptist Church Road. 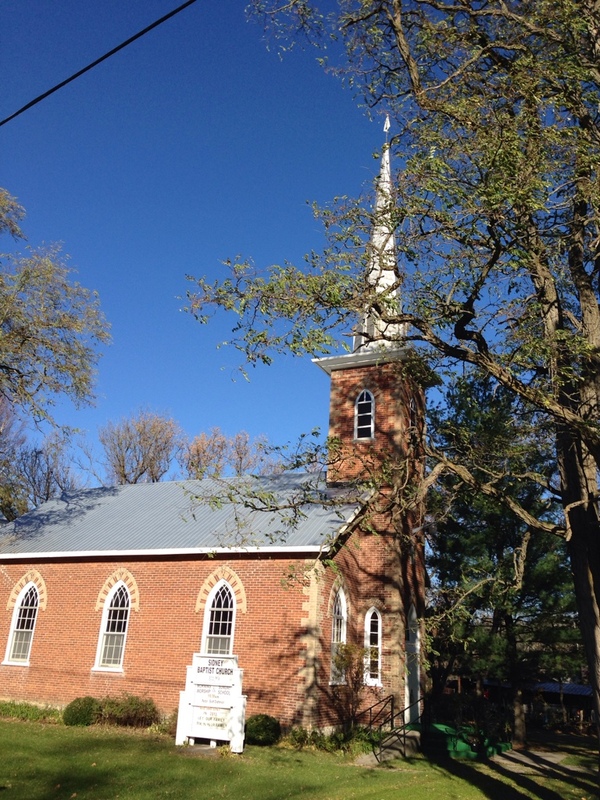 Now, given the name, I probably shouldn’t have been surprised to come upon this pretty and historic Baptist Church, but surprised I was. Why? Because it seems to appear out of nowhere as you’re driving north along that very quiet country road – and also because it is very impressive. I mean, it’s not a cathedral or anything, but for a rural church with no town anywhere in sight, it’s pretty sizeable. And the steeple! Man, that is one high (and very graceful) steeple. It is really quite a lovely sight – and also a historic one, as the plaque erected there tells you: one Asa Turner (I love that very old-fashioned name, Asa), came to the area as a missionary from the United States in the 1790s, and there helped set up the first Baptist association (doubtless a prelude to the erecting of an actual church building) in all of Ontario. And the coolest thing of all? This very historic and very beautiful “church in the vale” (as the old Carter Family song Church in the Wildwood puts it), Sidney Baptist Church, is still in operation all these years later. Sunday service is at 10:30 a.m. Good for them. You CAN go home again. And the chores haven’t changed. “You can’t go home again,” the American novelist Thomas Wolfe famously declared, using that pronouncement as the title of perhaps his best-known book. I confess I haven’t read it, so I don’t know how Wolfe reaches his conclusion, but I would humbly submit that the adventure that Raymond and I have had here at the Manse proves that you CAN go home again. “Back to where you once belonged,” as another writer (the British tunesmith Paul McCartney) put it. Late this afternoon I found myself thinking about how, when you buy the house you grew up in (in Queensborough, Ont. ), you can find yourself doing precisely the same chores that you were doing at that house several decades before. Which is a slightly odd, though not unpleasant, feeling. 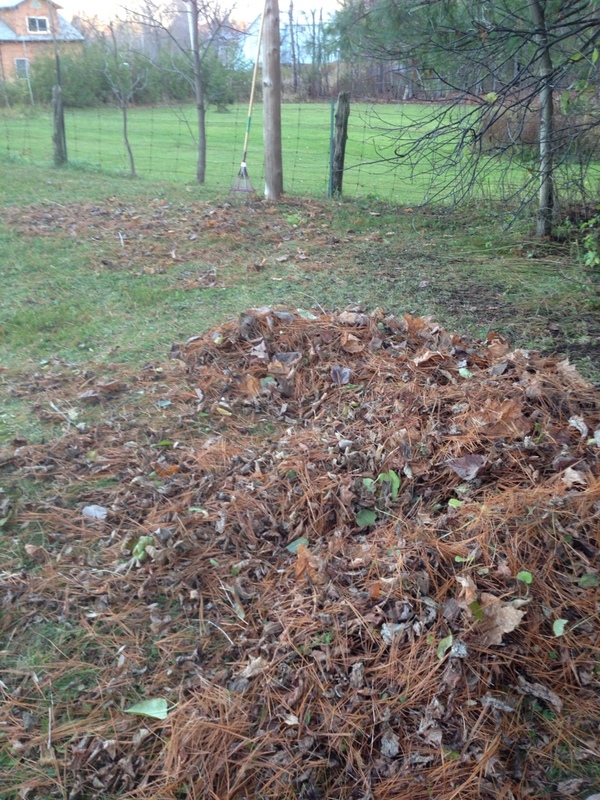 Anyway, toward the end of the exercise it suddenly struck me that, had it been a sunny after-school afternoon in late October 1973 instead of a sunny after-school afternoon 40 years later, in late October 2013, I would in all likelihood have been doing precisely the same thing in precisely the same place: raking up fallen leaves in the Manse yard. The only difference being that back then it would have been a chore assigned by my mum or dad (and probably protested bitterly by adolescent me), and this time I assigned myself, because – well, because it had to be done. I have to say that, cold and tired though I was by the end of the operation, the delight in the then-and-now symmetry of it all made up for everything. The AM radio station here in these parts is CJBQ 800 out of Belleville, and to get caught up on the local news I tune it in during my drive from Queensborough down to Belleville each day. Unfortunately the music featured on the morning program, in and around the news, weather, sports and chat, is contemporary country, and the only word I can use to describe it is – godawful. The songs all sound the same, the performers are interchangeable, the tunes unmemorable and the lyrics – well, don’t even get me started. Except I guess I’ve already got myself started.There is a stunningly large number of references in the songs to driving around in trucks, which strikes me as a singularly unimaginative theme. And when these songs try to tackle the venerable country-music themes of “heartbreak and desire” (as the great Emmylou Harris put it in Boulder to Birmingham, her achingly beautiful song about the death of “cosmic American music” legend Gram Parsons) – well, we end up with lines like this one, which I was particularly appalled to hear more than once this past week: “Whiskey burn her memory down.” What does that even mean? How can whiskey burn anything down? And then there’s Dolly Parton, who is one of my all-time heroes because she is smart and talented and tenacious and funny – and a fantastic songwriter. Think of My Tennessee Mountain Home, or Coat of Many Colors, or I Will Always Love You (which, for those of you who might not know, did not originate with the bombastic Whitney Houston). Or the song that is one of the great classics of country music, and one of the great examples of powerful songwriting by women. Of course I am talking about Jolene. Dolly Parton released that single in 1974, when I was a young teenager living in Queensborough (where I now find myself again, all these years later). It was a huge hit, and was played regularly on none other than CJBQ 800, which our school-bus driver generally had tuned in on the drive to and from school. I have fond memories of hearing it over and over during that joyous afternoon time when the bus was bringing you home to freedom at the end of the school day, along the back roads in the area of Madoc (where school was). It’s a song that has lots of the great country-music themes: jealousy, heartache, two women in love with the same man. But it’s framed in an original and striking way; and the tune is haunting. A masterpiece. Driving into Madoc the other afternoon, just a little later in the day than when the school bus used be delivering us home from school, I was tuned in to CBC Radio 2 (having heard one too many dopey songs from the 1950s on CJBQ’s hugely popular afternoon show with Freddy Vette) and host Rich Terfry made mention of the fact that Dolly Parton had suffered very minor injuries in a car accident this past week. He used it as a lead-in to a Dolly Parton song. Which, I am thrilled to report, was Jolene. It was so cool to hear that long-ago classic at that particular time and place. Yes, I know how I go on and on and on and ON about the Queensborough area being a beautiful part of the world. And I’m sorry if it bores you, but – I can’t help myself. With astounding frequency, I am stopped dead in my tracks by the wonder of what I see around me here. Maybe it’s because I’m so recently removed from the big city. Maybe it’s the sentimentalist in me, because this area is, after all, the place where grew up. Whatever: when I see something like this – amazing clouds, big sky, red barns – as I did on my drive home from work today, all I can do is be thankful. Come back to us, Kel Kincaid! I’ve made frequent mentions here at Meanwhile, at the Manse of two topics that are kind of related: one, my love for the products of the Hidden Goldmine bakery in Madoc (home of the Cinnamon Sparkle cookie, in my view the best cookie ever); and two, Kincaid Bros. IGA, which in the days of my childhood at the Manse in tiny Queensborough was the supermarket in “town” (Madoc) – and whose premises are now occupied by the Hidden Goldmine bakery/cafe operation. I love the fact that Hidden Goldmine pays tribute to the much-loved long-ago grocery store run by the Kincaid brothers, with old newspaper clippings about them on the walls and other memorabilia here and there in the shop. One of the best tributes to the Kincaids’ era, though, is on the exterior of the building, on the brick wall facing Elgin Street. There, above where the sign that must once upon a time have advertised the IGA store, is a big cutout figure of a white-mustached older gentleman hailing passersby. And he can only be Kel Kincaid, one of the brothers who ran the store and the one who seemed to have the most to do with the customers. My memories of Kel are pretty long-ago and dim, but they are of an unfailingly kind and helpful gentleman, a great small-town businessman. And that much-larger-than-life Kel on the side of the Hidden Goldmine building makes me smile nostalgically every time I go by it. So I was taken aback late this afternoon when, passing through Madoc on my way home to Queensborough from work in Belleville, I saw that the figure of Kel was – missing! Where he should have been on the side of the building there were instead only some bricks in a Kel-shaped pattern (see my photo atop this post) that were darker than the bricks around them, having been protected against the sun and the elements by the Kel figure for so many years. 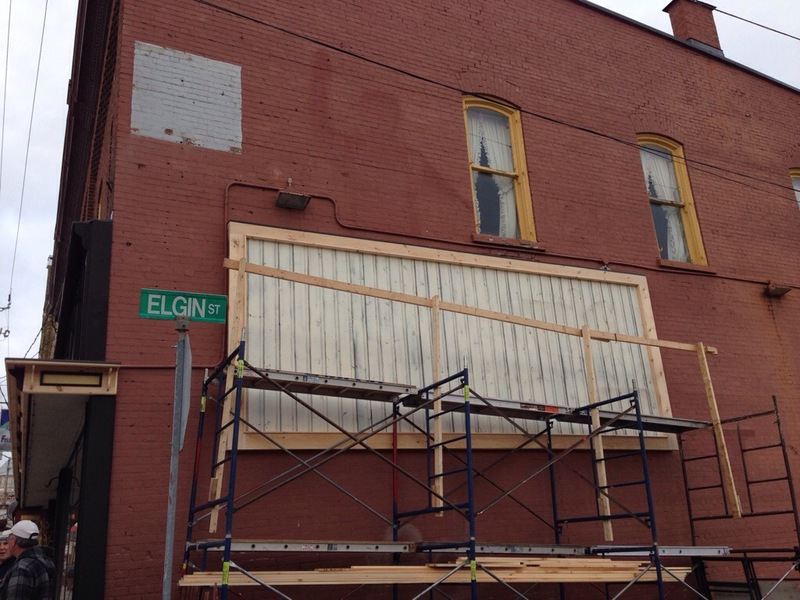 I think and hope that Kel was only missing because some work is being done on the exterior of the building. Scaffolding on the front, facing Durham Street, has only just come down, and now some other activity seems to be happening on the south side facing Elgin Street. So I fervently trust that Kel will be back when the work is done. Because for those of us who remember the Kincaids’ IGA, Madoc just wouldn’t be the same without Kel.